Alia Palace Luxury Hotel and Villas is a 5-star hotel located in the tranquil surroundings of Chalkidiki, overlooking the Cassandra Gulf. The hotel is close to the Pefkohori village, which is a famous tourist site in the south-eastern peninsula of Greece. The hotel is 10 minutes from the beach and a free beach shuttle is provided. it is built at the top of the village and affords amazing views of Pefkohori, the Toroneos gulf and Sithonia. The Alia Palace features a large swimming pool area with a separate children’s section. There are sun terraces and loungers to sit back and relax near the pool. The main restaurants serve both Greek and international cuisines. The Panorama restaurant by the pool offers delicious snacks and salads. This family-friendly luxury hotel, set in a beautiful landscape, provides outstanding services to its guests. 24-hour reception is available along with daily room services and many other facilities. 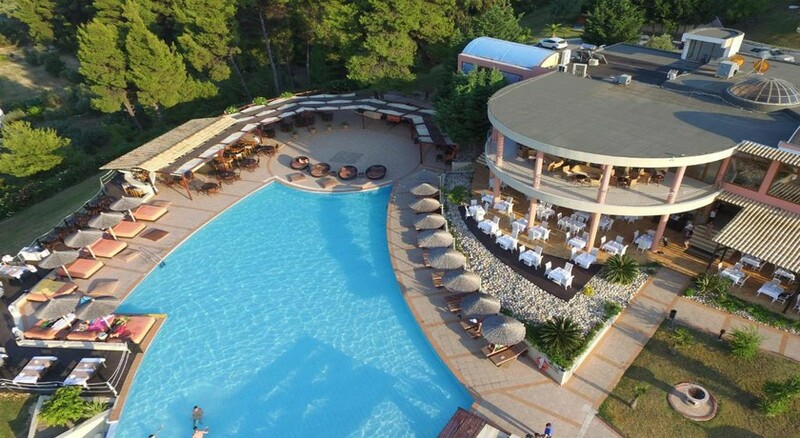 The hotel is 1 km from the beach in Chalkidiki, near the village Pefkohori. There are many shops, restaurants, and bars here and are within a 500 metre radius of the hotel. The Thessaloniki Airport is about 81 km from the hotel. 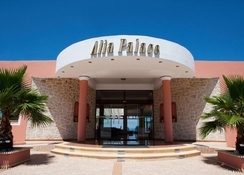 All the rooms at Alia Palace Luxury Hotel and Villas are air-conditioned, well-furnished, and nicely decorated. Depending on the type of room and its location, guests can enjoy views of the sea or the garden. The bathrooms are equipped with a bathtub and other amenities. Each room has adequate furniture, a satellite TV, wired internet connection, a radio-alarm clock, a mini bar (on request), a safe, a hairdryer, and a direct-dial telephone. Rooms are categorised as Standard rooms, Superior rooms, Superior Double rooms, Superior triple rooms, Superior family rooms, Junior Suites, and Executive Suites. The Standard rooms can accommodate up to 3 adults or 2 adults and 1 child. Double superior rooms can also accommodate up to 3 adults or 2 adults and 1 child. All rooms are well-equipped with room amenities and daily room services are provided. 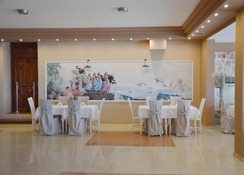 There are 2 main restaurants at the Alia Palace Hotel. The Poseidon serves breakfast, lunch, and dinner and offers a themed night every week. The Panorama situated next to the pool, serves delicious snacks and salads. The palace hotel also features a la carte restaurants with special Mediterranean and international cuisines. The pool bar serves refreshing drinks all day till late night. Another place to go for drinks or non-alcoholic beverages like coffee is the lounge bar. The all-inclusive board includes breakfast, late breakfast, lunch, dinner, local wine, soft drinks, and snacks. The hotel features a large outdoor pool area with a children’s section; the sun terraces and loungers nearby offering a perfect spot for relaxation. Guests can enjoy a massage, steam baths, a sauna, and hot tubs at the spa and wellness centre. 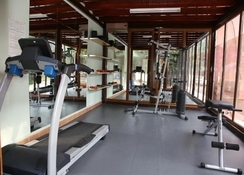 The hotel also has a fitness centre and a gym. Sports and leisure activities available in the nearby area include hiking in Chalkidiki, mountain biking, cycling, tennis courts, horse riding, and scuba diving. Guests can also visit the nearby beach where volleyball can be enjoyed along with other water sports. Fabulous place, views to die for and just wonderful staff. Couldn’t recommend it more. Food was basic. Not much choice and often the same thing.